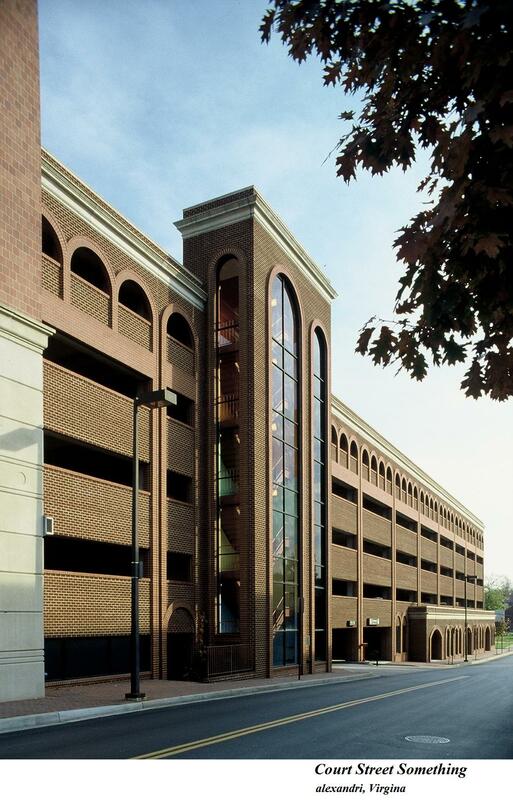 This six-story City owned parking structure in Frederick, Maryland, was build on a narrow, sloping site across the street from the County Courthouse. It was designed as a continuous helix type structure with end ramps and has space for 534 cars. Provision was made to expand the 6th floor another 22 car spaces in the future, should the City so desire. In addition to the 200,000 sq. ft. of parking, the first floor features 8,000 sq. ft. of retail space that faces a major city street. All levels are served by an elevator and are easily accessed by the handicapped. The structure rests on concrete caissons and consists of precast concrete planks on precast columns and beams. The exterior walls consist of a precast spandrel beam. The entire structure is sheathed in face brick. This Helbing Lipp Recny Architects project was a design/build contract and required completion in 240 days. Construction documents were produced using the fast-track method, thus allowing construction to proceed before construction documents were complete.